When I was younger I hated the idea of having to wear a uniform. To earn extra money I worked part time in a supermarket on top of my day job before I became a teenage mum. Their uniform at the time was a really drab brown a-line dress with a belt. An ugly colour with an ugly cut and it did no favours for anyone bigger than a UK size 8/US4. That first experience of wearing a uniform put me off the idea of ever wearing one for my day job. Luckily as a civil servant I don’t need to. But here’s the funny thing. 15 years after leaving that depressing brown dress behind I found myself creating my own work uniform. Needless to say brown doesn’t feature! When you are working full time with small children, time and money are often in short supply. 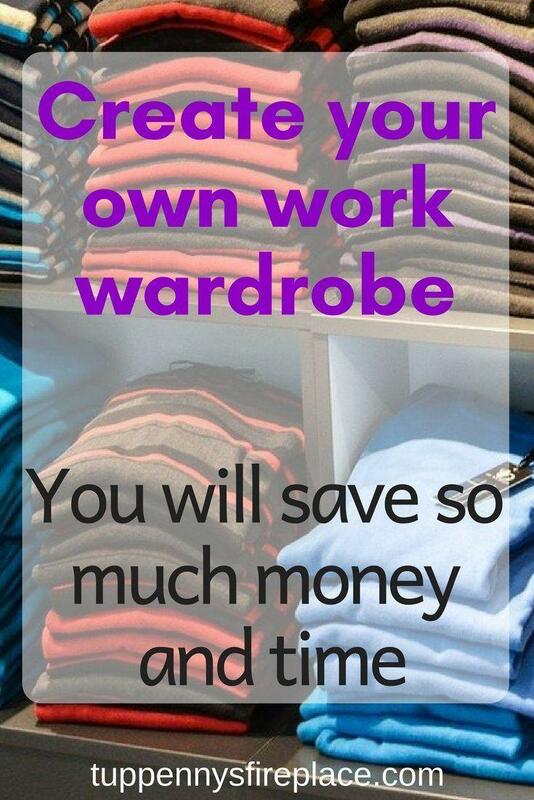 Even if you earn a decent wage I know you will put the children, bills and life first before buying yourself clothes to make you look and feel good whilst at work. When working you don’t have time to dress yourself carefully and stylishly. You don’t have the money to spend on the latest fashions to then wear them to work. When money is tight, buying clothes for yourself is your last thought. Many workplaces require you to dress smartly or smart casual. These are so broad that your entire wardrobe could fit these categories. Choosing what to wear every day from your entire wardrobe can be painful and time wasting. 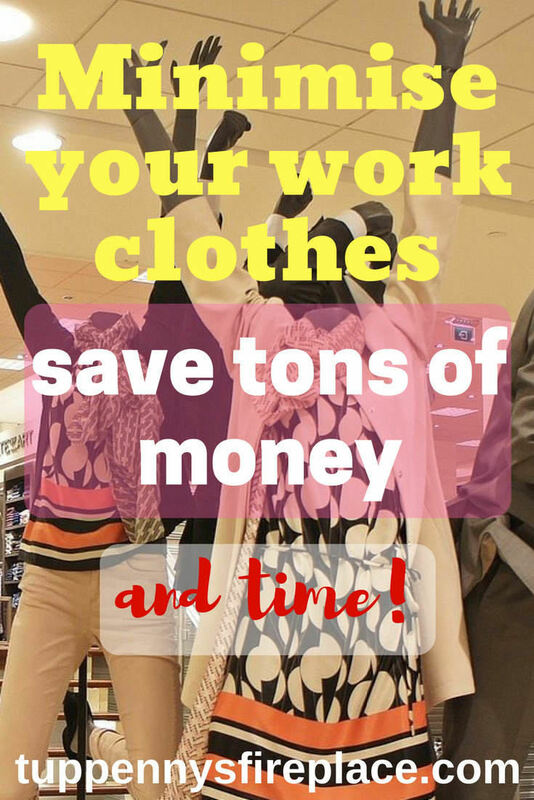 Spend too much on clothes so you have enough to wear both at work and at home? 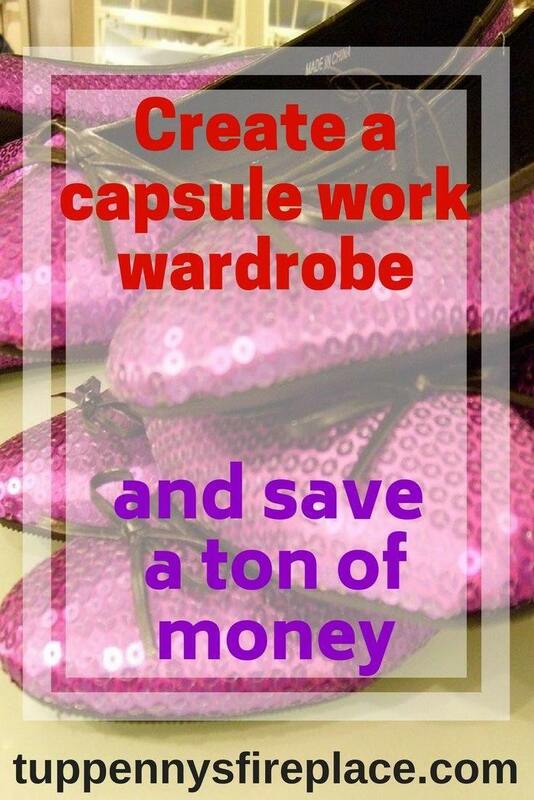 Follow me on Pinterest for more money saving ideas and frugal tips! 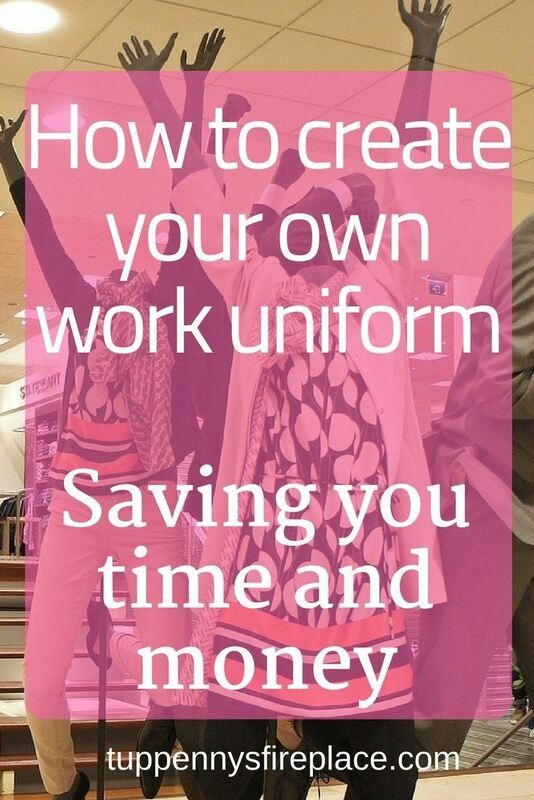 The solution is to create your own work uniform. By creating a capsule wardrobe for work you can stop wearing all your nicer gear. When you get a chance to go on a night out you will be able to wear something that feels special. Not something you’ve worn to work a dozen times before. You would never dream of wearing a supermarket uniform at home or on a night out so why do the same with normal clothes you wear to work? Keep your home clothes ring-fenced and you’re less likely to feel the need to shop for a new outfit ahead of a night out. I work in an office and manage a team so chose to team jackets with skirts and trousers. I don’t wear dresses as always feel uncomfortable in them due to how I view my shape/size (typical woman!). Both my navy jackets can be worn with the navy skirt and trousers I have. Indeed I have been know to inadvertently wear them with black trousers as I often get dressed in the dark! My work wardrobe is almost identical to the above apart from having navy not grey. Add in a pair of sandals for hot days and that’s your wardrobe for both summer and winter if you work in an office. You might want a jumper/cardigan/fleece in the winter but most buildings have central heating/air conditioning so possibly not. The only time I wear a fleece to work is when the central heating is broken! Finish off creating your own work uniform with a couple of go to accessories that you can wear daily. I gave up wearing jewellery, saves time in the morning. No more faffing trying to get stud earrings in! Indecision goes out of the window. 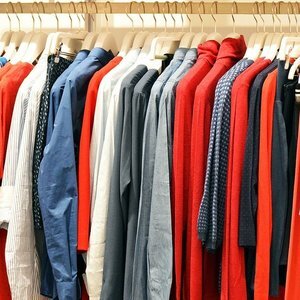 Your basic capsule wardrobe dictates the majority of what you are going to wear. You don’t need to worry about colour schemes as this is built into your work wardrobe. You save time as there is no time lost deciding what to wear, done and dusted in about 20 seconds, if that. You always know what your work wardrobe is and don’t have to think about whether something is suitable to wear to work or not. You’ve already done the hard work creating it. Having a base palette of 2/3 colours means you don’t spend money on the latest shiny new colour scheme to hit the shops. Once you have your wardrobe you only need to buy replacements. Most clothes last for years before needing replacing. You get into work mode more easily as soon as you get dressed. Once your wardrobe is established you will find that you become your work persona once dressed and you’re focused on work and being organised. Having created the basics for your work uniform the key thing is to build up your wardrobe over time. This is not an excuse to spend £500 on new clothes! Identify what you already have that can become exclusively work. In the ideal world you will have created a complete work uniform from existing pieces in your wardrobe. If that is the case then ensure you ring fence them from now on and only wear them to work. If having created your ideal work uniform you don’t have the right key pieces then plan how and when you will buy these items. 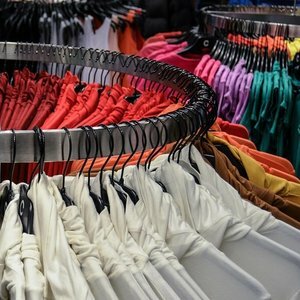 As you know these new clothes will only be for work, why not focus on getting as many as possibly from charity/thrift shops? Classic styles don’t date and can be picked up for a few pounds in many charity shops. 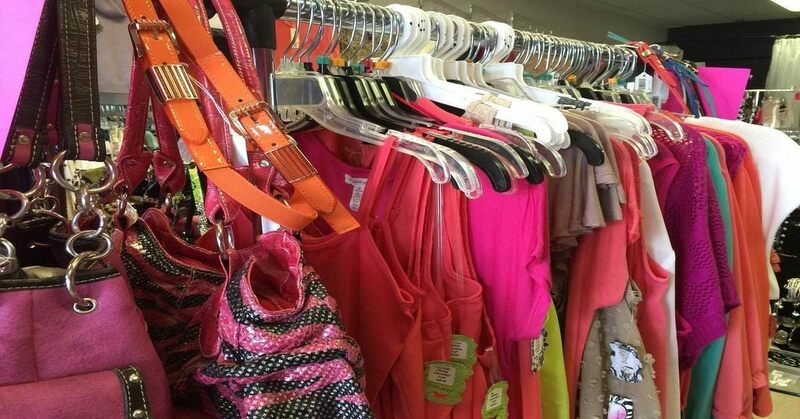 Choose charity shops in affluent areas and you’ll pick up well made, branded items. Half my work jackets are from charity shops including my favourite Laura Ashley navy short jacket. I bought it for £5 and it’s still going strong after 10 years! 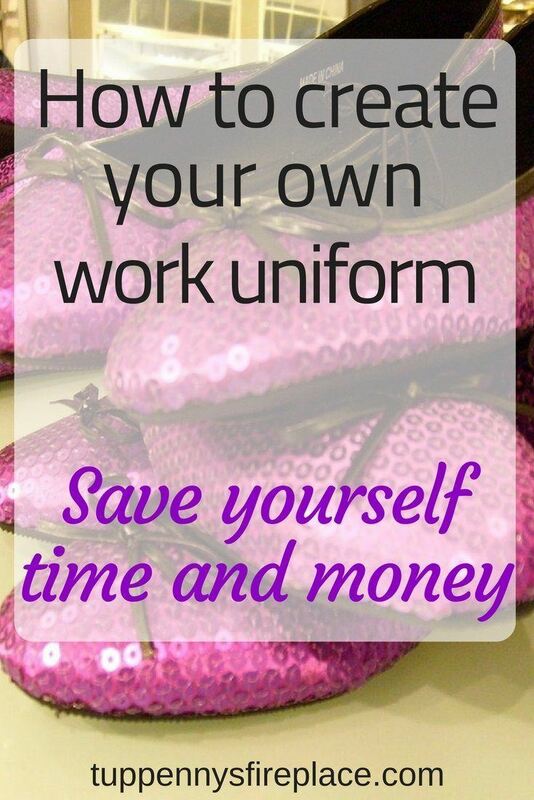 Choosing to create your own work uniform will save you money, time and stress. Identify what your work wardrobe will include. Buy from charity shops for additional savings. Spend the money you save on your family or save for a holiday – the choice is yours! This is so true – ALL of those problems sound familiar to me! I actually am envious of my children getting to wear their school uniforms every day – it is just so much easier not having to think too hard. Uniforms have a lot going for them. We hate them when we’re younger (school uniform – not cool), but now I would take a uniform any day. I’m all for the hassle free factors! The company I work for has two dress-down days – every Friday and also every Wednesday, where we all wear our company polo shirts with jeans etc, so I guess this is kind of like a uniform! Everyone also has a company fleece for when it gets cold in the office! So the good news is that I only have to think about what to wear 3 days of the week! I iron and hang up what I’m wearing the night before so I can sleepily just shrug into it in the morning (I’m not a morning person so everything needs to be ready the night before!). I’d say I’m ‘old school office’, in that I wear skirt, tights (or bare legs in summer) and heels at work, so my wardrobe is full of tops/blouses (of various colours) which I mix and match with my skirts (mostly black or grey or patterned variations, in various lengths). My suits are reserved for client/customer visits or interviews. I don’t wear any of my work clothes outside of work. In fact, I don’t wear skirts of any kind outside of work so perhaps I do see them as ‘work uniform’. I keep two pairs of heels in my desk cupboard in the office so I’m not wearing the same all the time. I wear trainers to and from work as I want to keep my shoes in good condition and don’t want to damage my heels as I power-walk to and from the office or run for my tram, which I do most days! I hadn’t thought about looking for work clothes in charity shops, so thanks for the tip. If work suggested wearing a uniform all the time, I’d definitely be up for it! Sounds like you have a uniform of sorts there Weenie. I like that your company has dress down days but it incorporates a logo’d t-shirt, maybe you could work on the senior officers to suggest extending these to 5 a week! I eventually gave up skirts as it’s quicker in the morning to pull on trousers than skirt and tights. I was also really hard on tights and their replacement costs were mounting so made the switch to trousers full time. Ooo – orange, now that’s a colour I haven’t worn. I always think of it as being a really strong, striking colour. But can see it would go very well with navy. Thanks for popping over. I love this idea! Most people are really not paying that much attention to the clothes you wear and, as a busy mom, this is just one more time saver. Yep my uniform came about because I had a pre-schooler and was working full time. Not enough hours in the day to do everything. Wearing my uniform meant no brain capacity lost thinking about clothes & accessories so could concentrate on getting DD1 out in time for school and DD2 ready for childcare. And free time is precious indeed. I am sure you can create your own uniform even if you are a SAHM, it probably works in all situations. Thanks for stopping by! Go for it. Doesn’t matter what job you do, out of the home or in the home. I now have go to clothing for when we go out for the night as they never get worn for work, a definite money saver. Thanks for stopping by! This is such a good idea! I feel like some days I spend way too much time trying to find matching clothes or decent clothes. Brilliant! When you are juggling little ones, work and everything else a mom does it makes sense to streamline the bits you can. Clothes and accessories are ideal for streamlining into a uniform you like and don’t have to think about 🙂 Thanks for reading. I love this post!!! I did this semi for myself by elminating a lot of my wardrobe pieces from what I wear to work. Now I wear black pants every single day, a tank top, and I just rotate my shirt (I have about 15) that I rotate between. Excellent. Saves so much time doesn’t it? I have navy and black I rotate between on a weekly basis, same blouses/shirts though for ease. All I have to think about on a Monday morning is whether it’s a navy or black week. Thanks for popping over! This is so helpful. I don’t work outside the home right now but I always want to look more professional.and put together. When I think of getting more clothes it’s overwhelming so this helps a ton. Thank you! Hi Nicole. Glad you find it helpful. I even have a similar system for home clothes. I’m all for something that means I don’t have to think too much in the morning! Thanks for stopping by. I’m all for this – I’ve been trying to simplify all my clothes, not just my work items. It really helps! Having a uniform for work definitely fits into the simplify category. I’m slowly simplifying my other clothes as well. makes life easier ans simpler. Thanks for reading. Sounds like me… trying to automate my life as much as possible… desire to make a few tiny decisions as possible on a daily basis. right now, i’m trying to figure out how the frugal woods hack on breakfast and lunch simplified can work in my journey. I wonder though if all the automation means missing out on simple parts of life… take away from creativity… like not having the sense of reward of a paycheck… since i haven’t seen one because everything id direct deposited. are we neglecting that positive feedback loop by automating everything? curious. Automating parts of your life has a lot going for it. I have the same breakfast and lunch every day at work for that reason – I don’t have to think abtou it either on the day or when I am shopping. However I wouldn’t want full automation so dinners are flexible as is snacks (ice cream!). I think you do need positive feedback and being able to have a sense of reward, however small that is. Oh, also…sometimes I just wear the same thing all week… like the same skirt or bottoms… i work in a call center… so maybe that gives me a little leeway…no fussing in the morning..
I’ll be honest – I often wear the same bottoms too! I work in an office and travel by car. How dirty can a skirt or trousers get?